Thank You for requesting your 'How To Tell If It's Your Intuition' Guide! While you're waiting for guide to make its way to your inbox, read this post on the 3 Most Common Things That Keep People Stuck And Stalled. and far away from a business & life that lights you up. So you became a coach, practitioner, online entrepreneur because you wanted to be doing something meaningful while making an impact, right? You wanted to be 'doing what you love' because that's where they said all our abundance, fulfillment and purpose lies, agreed? You had visions of working from anywhere while transforming lives; of waking up in the morning and bouncing out of bed because you're living your purpose and everything just flows! You saw yourself spending time with your family while your business ran itself and money hit your bank account while you slept. Now, I know personally know people who live that reality, so it's not 'pie-in-the-sky', that's for sure. I'm certainly on my way to that vision myself. So what's the missing piece? You've bought the courses, you've hired the coaches, you've enrolled in programs...so it's not that you don't have the information or the knowledge. How is it that you just can't get yourself moving forward? Why can't you get yourself out there? I bet you have an idea, because I know that you ARE self-aware, otherwise you wouldn't have signed up for my 5 day mini-course! Read on and see which of these 3 common things may be the reason you're staying stuck and stalled. We've been told over and over to love ourselves and to recite affirmations about how awesome we are. We've heard it so many times, we probably don't even take notice of it now! But, it is one of the biggest things we do to keep ourselves stuck. We tell ourselves we're not good enough. We tell ourselves we don't have our sh*t together enough to be advising anyone about anything. We tell ourselves we'll fail. Who'd be motivated by anyone talking like that to them? Now make a list of all the things you do RIGHT. Don’t just focus on business. Note down EVERYWHERE in your life that you are achieving outcomes that you set out to achieve. You remember to meditate when you have a shower every morning. You tell your partner and children you love them. You are always there for your them. You show up for your clients with everything you’ve got. You are continually upskilling so that you can give your clients even more. Keep going until you run out of things. Get into the FEELING of how accomplished you are. Practice this feeling every time you tell yourself a story about how you’re NOT achieving what you set out to achieve. Everyone is intuitive. And for women it comes SOOOO easily, so why don’t we listen to it? Did you know that intuition is one of the most powerful ways to create more money, time and energy? One thing that people don’t know is that INTUITION IS INSTANTANEOUS. AND IT IS ALWAYS RIGHT. So think about this: you have to make a decision in your business or your life. If you google decision-making you’ll find a ton of formulae that you can put to action in order to make the right decision. You can make a list of pros and cons. You can search a bunch of comparision websites. You can list all the reasons why this is the best decision to make. OR you can just ask your intuition. Decision made in a second. How long do you reckon it would take to make that list of pros and cons or read up everything? When you know what you’re looking for, you can start to really use your intuitive gifts to help you in all areas of your life and business. to decide whether to work with a certain person or not. And you're totally on the right path to hearing your intuition more because you've requested my guide on telling the difference between your ego and your intuition - woohoo! There is not one person on this planet, I reckon, who has never experienced procrastination. But what if it were more than just not wanting to do something we don't like? What if there was something deeper going on? If we don't have the confidence to do something, it's likely we aren't going to take action. If we believe others won't want to hear what we have to say, it is really hard to get out there and make a video about what we can offer them, for example. If we believe we could fail, some of us might not even bother trying. Take a couple of nice, slow breaths into your belly and feel yourself relax. Now, bring to mind something on your To Do list you have been putting off. Feel into what comes up when you imagine yourself taking care of that item right now. Do you feel like you could do it but you're putting it off because you simply don't like that job? That's an easy one, because you just need to get yourself motivated to do it and it'll get done. Do you feel fear or anxiety around getting the task underway? This is an indicator that there's a limiting belief tied to your procrastinating and it's time to dig deeper. Get out your journal or a notebook and spend time writing about what's coming up for you when you think about having to tackle this. What can you tell yourself that will make you feel better about doing it? Procrastination is a biggie. It's the most talked about reason why people stay stuck and stalled. PROCRASTINATION: Is it Fear or Intuition Keeping You Stuck? This recorded video workshop is a unique approach to procrastination that goes beyond what we're taught. Watch it at your leisure, in the comfort of your home, or listen to it as you're out and about. Learn the most common limiting belief that causes procrastination. I walk you through a meditation to find and clear that belief...and you can use this method for ANY beliefs you might want to clear. Learn how to use my signature 'How Would It Look' process to get yourself taking action IMMEDIATELY, even when faced with the most mundane tasks! Gain a new perspective on procrastination that's not taught anywhere else. "I just wanted to let you know that your workshop made a big impact. I woke up more energised like a weight had been lifted. 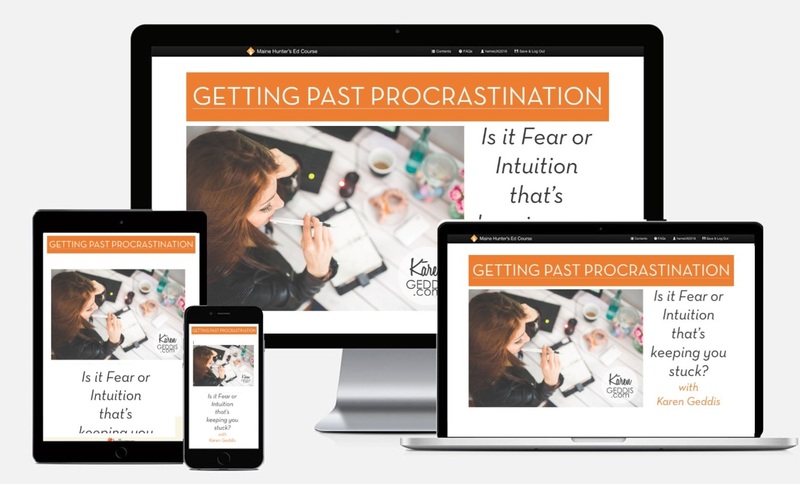 Order your Limited Time copy of this unique, results-focused and transformative mini-workshop, "PROCRASTINATION: Is it Fear or Intuition Keeping You Stuck?" today. You no longer need to be held back﻿ by your procrastination...take up this limited time offer and start taking inspired action toward creating that life and business that lights you up!